Established on February 19, 2010, Direct Millwork is a building material supplier specializing in interior and exterior millwork products. Our company supports its product offering with in-house assembly and light manufacturing capabilities, as well as on site take-off and project management experience. Our sales office and production facility are conveniently located at 256 Belvidere Avenue in Washington, New Jersey. 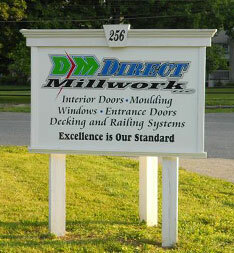 Direct Millwork’s primary delivery area is Central and Northern New Jersey along with the Lehigh Valley in Pennsylvania. Extended delivery radius includes New York, Connecticut and Pennsylvania. Our services begin with a consultation to assist in the selection and design of products. Comprehensive estimates are prepared and specific product details are then submitted for approval. Site inspections are performed for all jobs to obtain accurate dimensions and to verify quantities. Our standard procedure is for each customer to receive an order confirmation, scheduling updates, and post delivery follow-up on every order. This level of service and communication are unparalleled in the marketplace. The Company has a unique blend of industry experience with an in-flux of younger employees looking for career opportunities. Fifteen of the current staff has greater than 23 years of industry experience. Total years of experience equals 466 Years, which averages to 18.6 years per employee. Kevin began his career in the Millwork industry in 1979. He has extensive project management experience. Kevin holds a Residential and Light Commercial Window and Door Installers certificate issued by Architectural, Inc. and is a certified installer by OSI. He served on the Board of Directors of the New Jersey Building Material Dealers Association and was President of this organization in 2005 & 2006. Tom has more than 25 years of operational experience in Millwork distribution. Tom is skilled at product analysis based on profitability and optimizing efficiency. He is skilled in lean manufacturing and performing product analysis based on profitabilty. Tom is a certified Installer by OSI.